This is an enjoyable book. Bates seems to understand that this is also the way of the shaman and gives many examples of parallels. In one episode he recalls that during a color visualization exercise he saw a bright turquoise color surrounding a pupil. When the exercise was over the student said he was concentrating on the color blue. In several other exercises he leads students through out-of-the-body experiences. One student floated out under the door of the RADA (Royal Academy of Dramatic Arts), walked down the stairs out the front lobby, and floated to the top of the building. When Brian suggested he try flying from the top of the building, the student said he wanted to come back and reversed his steps back into his body. The book is filled with comments by well-known movie stars: Charlton Heston, Liv Ullman, Marlon Brando being his favorite sources. The stars' descriptions of their subjective processes comprise a wealth of information compiled in one place by Bates from many different sources. One would have to read multiple autobiographies to get the gems that Bates presents in synoptical order for us in this book. The practical exercises in observing and exploring the self, others and the world will be useful in various kinds of group work. The face exercise goes: "feel someone else's face with one hand and your own face with the other hand to compare the faces on a kinesthetic level (to avoid the visual preconceptions or maps we have ingrained in us). The other exceptional exercise is, "look at a person's face and draw it without looking at the drawing (only the face) until finished." Another idea for a guided meditation came from his description of magical dwarves that amputate body parts and replace them with new body parts. That could be developed into a guided fantasy in which a person imagines his entire body being rebuilt according to his desires. Once his fantasy body is rebuilt, the idea is the that the actual body will follow. A fourth exercise is, "let your 'body' expand to fill a large room and then explore the space as the inside of yourself." 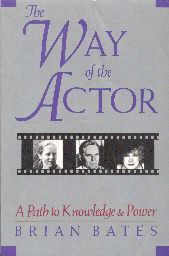 The way of the actor seems to be the way of the shaman and the way to create magic in the world both on and off the screen.